The numbers: 15,000 and 26,000. 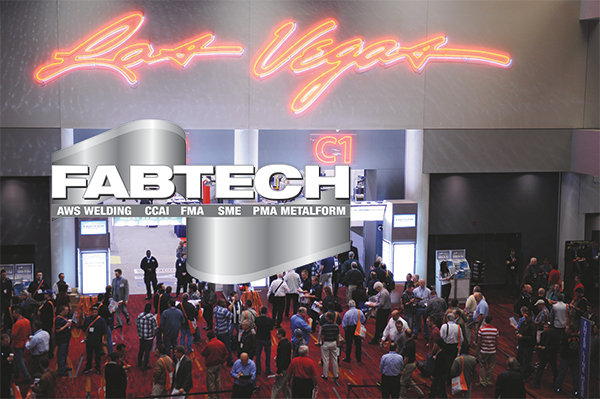 That’s how many people, respectively, attended FABTECH 2012 in Las Vegas on its first day (Monday, November 12) and overall. By all accounts the metalforming and fabricating show was a tremendous success, as exhibitors took numerous equipment orders right from the show floor. And, optimism for 2013 abounds, as show organizers already have booked more than 500,000 sq. ft. of exhibit space for the 2013 FABTECH show in Chicago. As I was (and wrote here) last year post-show, I’m still reveling in the party that was FABTECH. If you were there, you know what I mean. The record number of first-day attendees, and in fact all of the 2012 show attendees, were, from all accounts, not tire kickers. Equipment orders were being taken right and left. From the METALFORM side of the show, servo presses remained the center of attention. And we also spoke with exhibitors about the rising demand for custom hydraulic presses; new lubricant technology, including “green” stamping lubes; and software enhancements promising to deliver improved management of design and manufacturing functions, from the management suite to the production floor. What follows are just a few highlights from FABTECH 2012; we presented other product introductions made at the show in our October 2012 FABTECH show issue. And, we’ll feature additional new-product introductions in coming issues of MetalForming, and in our quarterly sister publication Fabricating Product News. 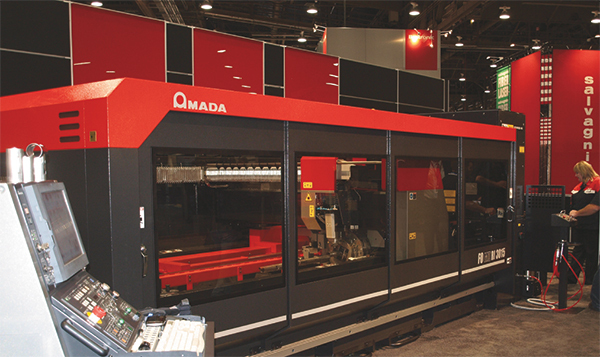 Amada has expanded on its FOM2 laser-cutting system by adding an innovative rotary index, “delivering the power and speed to efficiently cut mid to thick materials,” say company officials. The rotary index is located on one of three interchangeable shuttle pallets, making it easy for metalformers to switch from flat sheet cutting to tube or pipe cutting. Amada’s FOM2RI-3015 can process round, square, rectangle, C-channel and angle iron, taking on materials as heavy as 441 lb. Included is Amada’s Dr. Abe Tube process software that houses programs for cutting many common shapes and configurations, making it easy to fabricate tubular structures that fit together for welding. The rotary index is an integrated unit, allowing the cutting head to be positioned near the controllable pneumatic chuck and minimizing the dead zone. Bowed pipe or tubing can be cut without vibration while maintaining accuracy from end to end. Miller Electric Mfg. 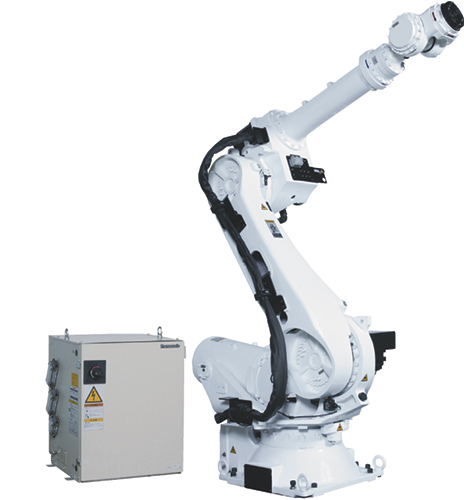 Co. released three new material-handling robots—the HS-80, HS-165 and HS-200—designed to position large weldments for optimum welding conditions. The common G3 operator pendant and language avoids the need to learn numerous robotic languages—one pendant handles communication between welding machine and handling robot. Metalformers can use the robots to perform jig-free welding, to reduce cycle times and minimize or eliminate out-of-position welding. “The handling robot does the work, placing the material in the optimal position,” adds Summers. Exacta adjustable V dies, introduced by Wilson Tool Intl., allow fabricators to adjust the width of the V-opening from 1 to 18 in., in 1-in. increments, eliminating the need to purchase multiple dies with different openings. A single operator can adjust the opening as needed by moving the side blocks and then locking them into position. This greatly reduces changeover time and improves productivity, say company officials. The die assembly can be configured to remain on the press permanently and function as a standard die holder, further reducing the amount of time operators spend on setups. Exacta adjustable V dies can withstand as much as 200 tons/ft. They are induction hardened and include hard chrome rollers to help reduce the tonnage required by as much as 20 percent. 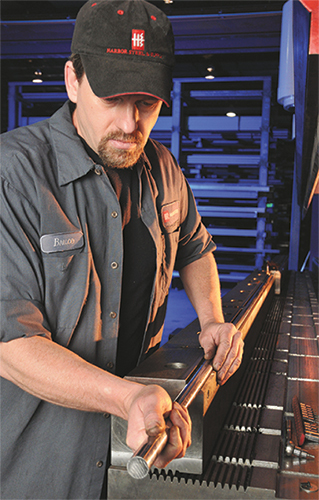 The chrome rollers can be replaced onsite as necessary, minimizing maintenance costs. 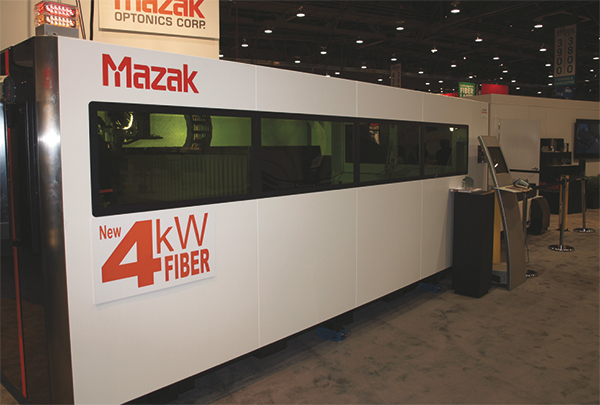 Mazak Optonics demonstrated its Optiplex 3015 4-kW fiber-laser cutting machine at its FABTECH booth. Compared to conventional laser-processing machines, the system reportedly increases the productivity of thin worksheet cutting with impressive accuracy and cuts cold-rolled steel to ¾ in. thick. The Optiplex 3015 Fiber also processes reflective materials with greater thicknesses and at greater speeds than its CO2 counterpart. The machine uses the firm’s new PreView 2 CNC control, which automatically determines the required processing conditions for the material prior to cutting. Also new from Mazak Optonics is the availability of its Super-Turbo-X Champion with a 2.5-kW resonator. Built on the firm’s hybrid platform, the machine boasts a 1786-lb.workpiece capacity for sheets as thick as 0.87 in. SigmaTek Systems showcased its latest release of SigmaNest—Version 10—which, says company president and CEO Ben TerreBlanche, employs sophisticated heuristics and advanced algorithms to optimize part yield, maximize material usage, accelerate machine cycle time and produce the highest quality parts. “Improved cutter-path planning reduces machine cutting-cycle time and consumable wear, extending tool life,” says TerreBlanche. New functionality includes Bolt Hole Quality (BHQ) technology, designed specifically for plasma-cutting machines to improve edge quality, by addressing inherent material melting issues. By tightly controlling this cutting process, BHQ reportedly optimizes hole quality and eliminates clean-up or rework. Other SigmaNest 10 enhancements, as explained by product manager James Lindsey, include tight integration with MRP and other manufacturing and business systems, to catalog material remnants for future job runs; and SolidWorks Enterprise PDM integration. Trumpf debuted the TruLaser 5030 cutting machine at FABTECH outfitted with a 5-kW solid-state TruDisk 5001 resonator, capable of cutting mild steel to 1 in. thick and nonferrous alloys to 0.4 in. Also introduced at the show was the new CoolLine option for 2D laser-cutting machines, which sends a water mist toward the workpiece during cutting to cool the material. CoolLine, which includes a specially designed cutting head, varying nozzles and a water supply tank, allows fabricators to achieve higher quality cuts with smaller contours or greater complexity, and the ability to nest parts more closely together, according to Trumpf officials. While processing, the CoolLine nozzle directs a water mist around the laser beam as it reaches the workpiece. In doing so, it reduces the amount of heat transferred in the immediate cutting zone and achieves contours that would otherwise be difficult or impossible to process. With this new option the user can cut small sidewalls and difficult geometries more efficiently, especially in thick material. It also achieves a considerable increase in process reliability when laser processing low-grade material or material of varying composition. 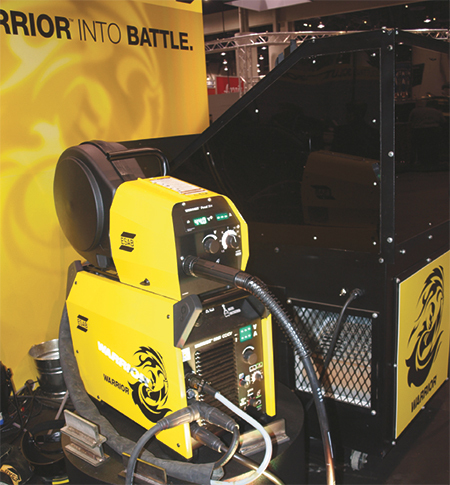 ESAB Welding & Cutting Products introduced FABTECH attendees to Warrior, a new multiprocess welding-power source and wire feeder designed for general fabrication and for the shipbuilding, railcar, energy generation and other industries. Capable of providing power for the GMAW (mig), FCAW (flux-cored), SMAW (stick) and GTAW (tig) processes, as well as arc gouging, Warrior is rated to 500 A at 60-percent duty cycle. Designed with input from welders, Warrior carbon-arc gouges with electrodes to 3⁄8-in. dia., welds with solid and flux-cored wires from 0.030- to 5⁄64-in. dia., and offers a full range of SMAW capabilities with excellent 7018 and 6010 performance. Its user-friendly design places all controls on the front panel, including the power switch, and knobs are designed for use when wearing welding gloves. The Warrior Feed 304 wire feeder features a high-torque four-roll drive, which reportedly gives superior feed even with long GMAW guns. 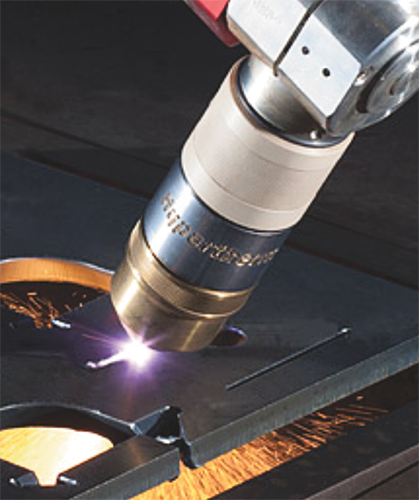 Hypertherm announced the release of new edge-profiling technology designed to help fabricators more easily achieve accurate bevel cuts during automated plasma-arc cutting. Its new True Bevel technology includes factory-tested mild-steel cutting-parameter charts for all Hypertherm HyPerformance HPRXD plasma systems. In addition to True Bevel, Hypertherm announced several other advancements to its HyPerformance HPRXD product line, including new HDi technology that delivers optimum performance on thin (less than ¼ in. thick) stainless steel. Additionally, pierce performance on thick stainless has been significantly improved, say company officials, thanks to patented PowerPierce technology and a new controlled-motion pierce process that enables piercing on stainless as thick as 4 in. From Wintriss comes ShopFloorConnect factory-reporting software and hardware, designed to automatically collect production data that is timely, accurate and unbiased. The software package comes factory-configured to talk to the ShopFloorConnect Machine Interface over an existing Ethernet. It tracks machine uptime, downtime, the reasons for downtime, production rate and piece-part counts (when applicable). It then displays real-time factory status in your web browser, and enables the creation of customizable reports—no special client software is required. 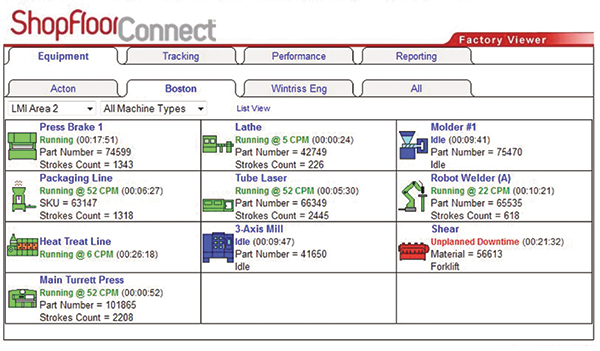 Using the scheduling interface in ShopFloorConnect, an engineer can create a queue of jobs to run in each machine. He then can either import a schedule from existing ERP software, or use ShopFloorConnect’s web-browser interface to select the appropriate jobs and the quantity of parts required. The program predicts the completion time/date for each job in the queue with an algorithm that analyzes real-time and historical changeover and production data. And, when computing overall equipment effectiveness (OEE), rather than use a single ideal performance rating for each machine, ShopFloorConnect applies a specific ideal rate for each job segment/machine combination. In applications where a machine must make more than one cycle to produce a part, Shop-FloorConnect automatically divides the ideal rate by the number of cycles required to make the part. It keeps a running total of the actual parts produced by the machine, and the number of parts that could have been produced according to the ideal rates and multipliers.